I first started the M.A.E Technique "Callanetics" in 2001 and from the very first class I was hooked. I was so dedicated to the programme that in 2007 I decided to become a teacher myself, taught on a one to one basis by Mary Adams herself and then went on to become a senior teacher myself the same year. The training was hard but in the end I was delighted when I passed and became a fully qualified teacher and still have access to Mary Adams on a regular basis and together we train and try out new moves to add to the M.A.E Technique "Callanetics"
After I passed the course I decided to open a studio myself here in the north of Glasgow, hence the name `Studio North`. 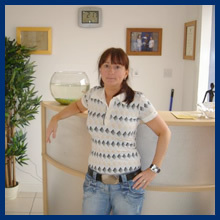 My studio has now been opened since October 2007 and since then I have a good number of regular students coming through the door who like myself have become hooked by the M.A.E Technique "Callanetics" and the amazing results to their bodies.